The legal status of women in Islamic countries varies broadly around the world. In some countries, for example, current legal codes allow men to force their female relatives into unwanted marriages, and/or give men exclusive or much broader access to divorce than to women. In other countries across the Middle East and North Africa, several Muslim governments have begun to expand the legal rights and protections for women — and in particular, to revise their countries’ Family Law. Family Law is the category of law that deals with family issues and domestic relations. These laws govern at what age and whom an individual may marry, and at whose behest; whether, how, and by whom an unsuccessful marriage may be legally terminated; and how custody and financial support arrangements will be settled after a divorce. Because they deal with such intimate issues, these laws have a very direct and immediate impact on women in Muslim communities. 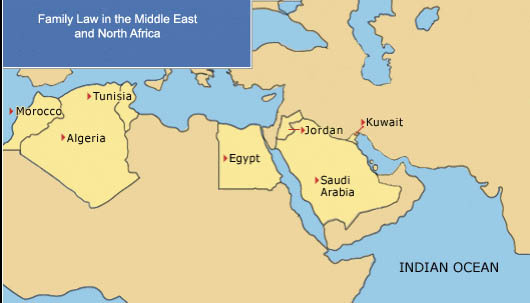 Follow the links from the map below to learn more about current Family Law in the highlighted Middle Eastern and North African countries.